Vital records of Salisbury, Massachusetts, to the end of the year 1849, Topsfield, Mass. : Topsfield Historical Society, (1915) , p. 151. William Richard Cutter, Historic Homes and Places and Genealogical and Personal Memoirs Relating to the Families of Middlesex County, Massachusetts, New York: Lewis Historical Publishing Company, (1908) , Vol. 4, p. 1967. "New York, County Marriages, 1908-1935," index and images, FamilySearch (https://familysearch.org/pal:/MM9.1.1/XVGR-HLW : accessed 06 Dec 2012), Max Marx and Nelle Colby, 1911. Watertown Records, Comprising the first and second books of town proceedings..., Watertown, Mass. : Fred G. Barker, (1890) , Vol. 3, p. 159. Henry Bond, Family Memorials: Genealogies of the Families and Descendants of the Early Settlers of Watertown, Massachusetts, Including Waltham and Weston; to which is Appended the Early History of the Town, Vol. 1, , at https://books.google.com/books?id=fIc-AAAAYAAJ . Boston: Little, Brown & Company, (1855) , p. 44. Watertown Records, Comprising the first and second books of town proceedings..., Watertown, Mass. : Fred G. Barker, (1890) , Vol. 3, p. 115. Thomas W. Baldwin, Vital Records of Cambridge, Massachusetts, to the year 1850, Boston: Wright & Potter Print. Co., (1914) , Vol. 1, p. 468. Thomas W. Baldwin, Vital Records of Cambridge, Massachusetts, to the year 1850, Boston: Wright & Potter Print. Co., (1914) , Vol. 2, p. 653. William B. Lapham, History of Bethel: formerly Sudbury, Canada, Oxford County, Maine, 1768-1890; with a brief sketch of Hanover and family statistics, , at https://books.google.com/books?id=4vUgAQAAMAAJ . Augusta, Me. : Press of the Maine Farmer, (1891) , pp. 585, 587. Capt. Hugh Mason Genealogy, at http://kinnexions.com/kinnexions/mason/rr_toc.htm, #466. Capt. Hugh Mason Genealogy at http://kinnexions.com/kinnexions/mason/rr_toc.htm, #465, #466. 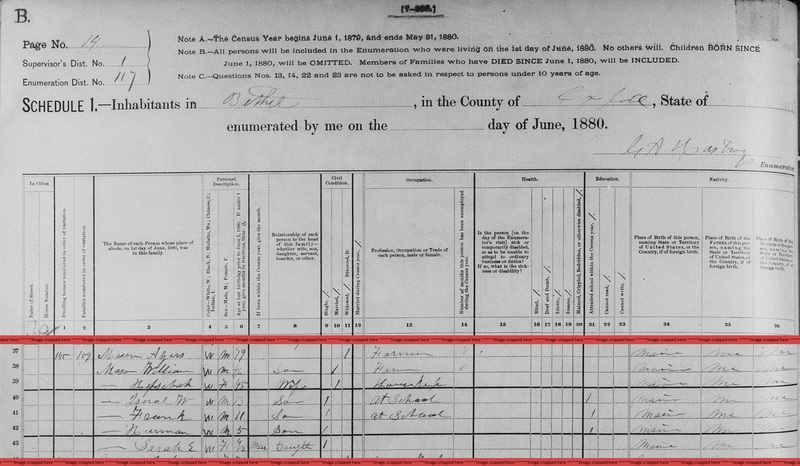 "Maine Births and Christenings, 1739-1900," database, FamilySearch (https://familysearch.org/ark:/61903/1:1:F43J-QXH : 4 December 2014), William Wallace Mason, 10 Mar 1824; citing CIVIL, BETHEL, OXFORD, MAINE; FHL microfilm 10,606. Concord, Massachusetts Births, Marriages, and Deaths 1635-1850, , at https://books.google.com/books?id=vs8UAAAAYAAJ . Boston: Beacon Press, ([1891?]) , p. 250. Vital Records of Beverly Massachusetts to the End of the Year 1949, Topsfield, Mass. : Topsfield Historical Society, (1906) , p. 206. Vital Records of Beverly Massachusetts to the End of the Year 1949, Topsfield, Mass. : Topsfield Historical Society, (1906) , p. 424. Vital Records of Beverly Massachusetts to the End of the Year 1949, Topsfield, Mass. : Topsfield Historical Society, (1906) , p. 115. Edna Warren Mason, Descendants of Capt. Hugh Mason in America, , at https://archive.org/stream/descendantsofcap00maso . New Haven, Connecticut: The Tuttle, Morehouse & Taylor Company, (1937) , pp. 462-3. William B. Lapham, History of Bethel: formerly Sudbury, Canada, Oxford County, Maine, 1768-1890; with a brief sketch of Hanover and family statistics, , at https://books.google.com/books?id=4vUgAQAAMAAJ . Augusta, Me. : Press of the Maine Farmer, (1891) , p. 585, 587. Capt. Hugh Mason Genealogy, at http://kinnexions.com/kinnexions/mason/rr_toc.htm, #465. 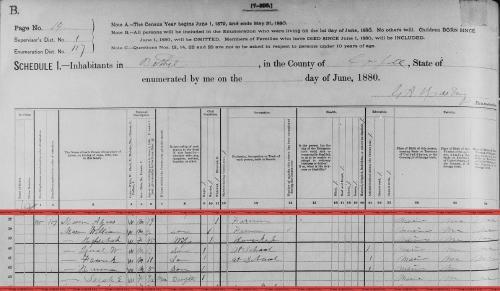 "Maine Marriages, 1771-1907," database, FamilySearch (https://familysearch.org/ark:/61903/1:1:F4X7-NY7 : 4 December 2014), Charles Mason and Eunice Hale, 13 Oct 1823; citing Civil, Waterford, Oxford, Maine, reference ; FHL microfilm 12,625. Capt. Hugh Mason Genealogy, at http://kinnexions.com/kinnexions/mason/rr_toc.htm, #872.